Notes: The repeater has directional coverage towards the Northeast Kingdom, and covers significant portions of the I-91 corridor. The repeater works well towards Morrisville, Craftsbury, Lyndon, Danville, St. Johnsbury, Concord, Lunenburg, Guildhall and Lancaster, NH. The Cabot Repeater is linked full-time via RF to the Vermont Interconnect System. 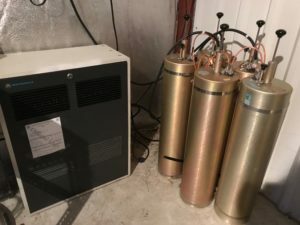 The repeater is temporarily running at 25 watts but has an extremely good receiver, and frequently copies stations in Maine and Canada. If you can hear it, it can DEFINITELY hear you. The Cabot Repeater was upgraded in June of 2018 from a GE Mastr II to a Motorola MSF5000. The MSF5000 currently runs 25 watts**. The repeater is connected to a five-cavity TX RX Systems duplexer, which provides plenty of isolation. The repeater feeds about 200 feet of 1.25″ hardline which runs to a 4-bay dipole providing around 7dbd of gain. The link radio is a Motorola mobile radio, attached to a directional antenna on the tower. All of this is controlled by an S-COM repeater controller. ** The repeater is currently at reduced power output of 25 watts. Normally, the system runs around 100 watts. The output will be increased when a higher power PA is acquired.